Ahh, the early 2000s. It was the decade of experimentation for Millennials everywhere. Fuzzy boots complemented mini skirts and anything bedazzled was our religion. Jeans were belted with our dad's ties and tees were never without a slogan. But let us not forget the best spiky hairstyles of the early 2000s, usually frosted at the tips or streaked with the chunkiest of highlights. Spiky hair was an early millennium trend that didn't discriminate. It transcended age and gender, and fit in with every aesthetic. It was a style favored by the dreamy heartthrobs of our favorite boy bands. But grungy, skater types definitely rocked the spikiest of spikes, too. Even some cutesy pop divas gave the trend a whirl, albeit with a few crimps to balance out the edginess of it all. I'm surprised there was enough hair gel to go around, what with all of the obsessive spiking going on. As cringeworthy as the look might seem now, spiky hair was the thing to do. The universality of it made the aesthetic impossible not to try. Check out all of the best spiky 'dos of the early 2000s that show just how creative we got when dousing our locks in gel. There was no P!nk without her signature spikes. The punk princess had one of the best manes around, usually dyed a fluorescent pink, because duh. Here, P!nk toned the edginess down a bit by sporting these perfectly tousled, soft, blonde spikes. Who would've thunk it? Brad Pitt with bleached tips? It's almost too good to be true. But like I said, spiky hair was for everyone. When Missy Elliott took on the spiky hair trend, she made the style her own, opting for skinnier spikes that flared in all directions. We were so used to seeing bleached ones that her burgundy 'do was a breath of fresh air. That frosted lipgloss was an amazing thing, too, so her pout gets an honorable mention. Justin Berfield played Reese, Malcolm's terror of an older brother on the sitcom Malcolm In The Middle. Spiky hair was the only hairstyle that could suit one of the most delinquent characters we had ever seen. Berfield's look definitely reminded many of us of all the spiky-haired troublemakers we secretly crushed on in middle school. Leave it to the gorgeous Halle Berry to make spiky hair so glamorous. She showed us that you didn't have to be a total punk to embrace the style. A little bit of spiking went a long way if you wanted to give your 'do a hint of sass and edge. When I get nostalgic about frosted tips, Justin Timberlake instantly pops into my head. 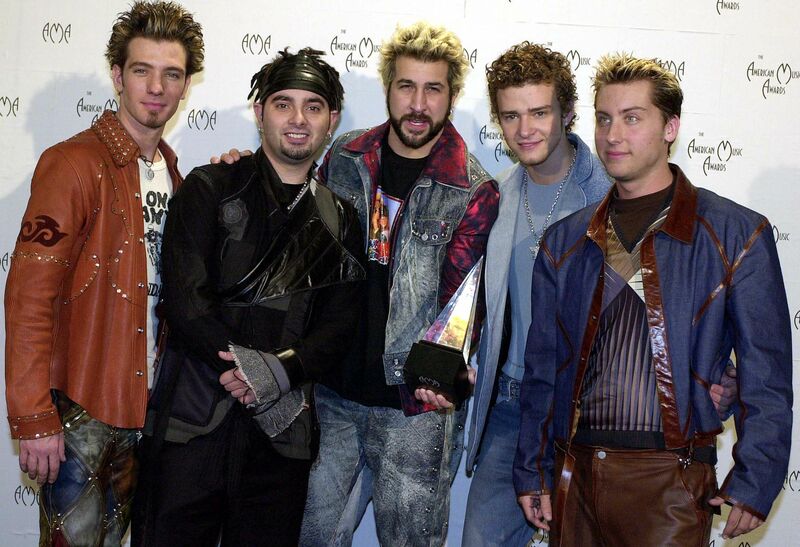 But honestly, the members of *NSYNC had some of the best spiky hair to ever grace the early 2000s. Each member managed to take a unique approach to the style. But no matter their differences, they all did it so right. As the television mom of double trouble twins on The Suite Life Of Zack And Cody, Kim Rhodes was one trendy mama when it came to her hair. Her character was never without frosted, spiked tips that were worthy of any *NSYNC member's approval. If anyone was going to do spiky hair justice, it would have to be an Osbourne. Kelly Osbourne must have been determined to have the tallest, boldest spikes around, because her mane took the trend to new heights. You could probably spot that highlighter color from outer space. Of course, Kelly had to get her inspo from somewhere. Who better than her mom to show her how it was done? Sharon Osbourne always had a soft spiking to her 'do, and we loved every pointed follicle of her signature maroon strands. Kelly Rowland gave the trend some feminine flare. Her hair was sort of a hybrid of spikes and curls — and if it was good enough for a Destiny's Child star, it was good enough for us. Honestly, Dennis Rodman tried it all back in the day. He even tested the spiky-haired waters. When you dye your spikes to match your team colors, you're a true winner. Lizzie McGuire's awesome hair taught us a thing or two about crimping, butterfly clips, and bandanas. But she showed us how to get creative with our spiky hair, too. I honestly believe some kind of sorcery was involved in order to achieve this twisted, spiky 'do. There's no other explanation, because we def struggled in the bathroom mirror when trying to imitate her look as tweens. While we drooled over Jessica Simpson's trendy style, her then-husband Nick Lachey was serving us early 2000s spiky hair realness. Lachey took the subtle approach to his spikes, but they were just as worthy of praise. In the spirit of spiky hair-wearing boy band dreamboats, Nick Carter was up to speed with the trends. He clearly got the memo that the only way to win the hearts of teenyboppers everywhere was to rock blonde spikes. A word to the wise, Aaron, your brother was onto something. We all know that the Spice Girls were some of the biggest trendsetters of them all, so it's no surprise that Victoria Beckham rocked spiky locks. Notice how her bangs even had a pointed nature to them. By the way, you're not seeing double. It's just Posh Spice with her true-to-life wax figure. Mark McGrath went a little overboard with his frosting, as did most folks when it came to anything involving early aught style. Come to think of it, he's still keeping this 'do alive today. One of the earliest America's Next Top Model winners, Eva Marcille got "the chop" most contestants received during their makeovers on the show. Snaps to Tyra Banks for making that judgement call because the short, spiky, curly hairstyles Marcille rocked were beyond gorgeous. And so on trend, might I add. As an early 2000s boy band, B2K had no choice but to have a member with spiky hair. At this point, it was an unspoken rule. J Boog clearly volunteered to be the group's spiky-haired singer. It was only then that we could officially say they were cool, after all. This. Is. Real. Life. Leonardo DiCaprio actually rocked frosted tips in the early 2000s. It's hard to believe the actor dabbled in the art of spiking one's hair, but it happened. It's the same Leo we know and love, just with trendier hair. As with most looks from our childhood, spiky hair has long since faded away. But when it had its moment, boy did it live strongly in the spotlight. R.I.P. to one of the most badass hairstyles of all time.